When I think of Idaho I think potatoes. Henry Spalding was the first to plant potatoes in the rich volcanic soil of Idaho in the 1830s and today the state produces more potatoes than any other. The potato is so essential to Idaho’s economy it was deemed the official state vegetable in 2002. Since the potato’s introduction to the US, horticulturists have been experimenting and growing new and different varieties of potatoes. I have done my own experiments using potatoes on pizzas by grilling or using french fries. 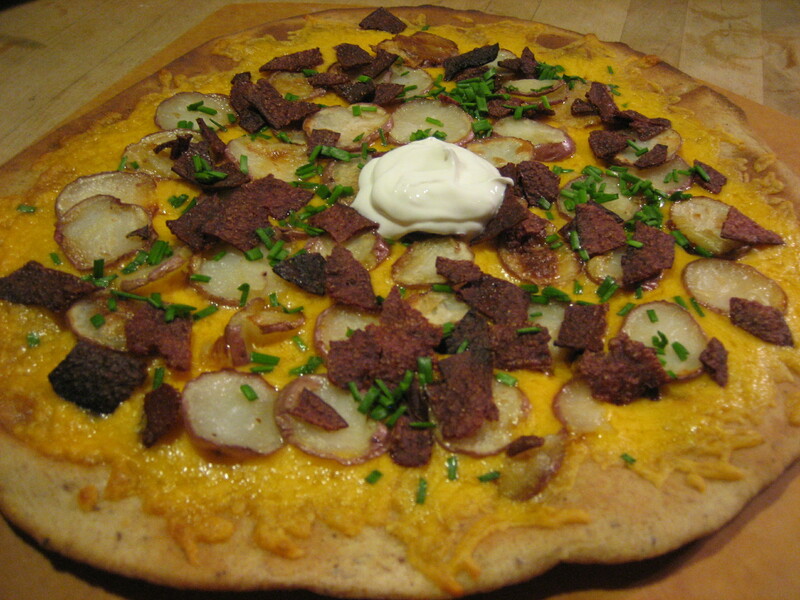 Today, I turned one of my favorite potato appetizers into a pizza: Potato Skin Pizza. I started by slicing small potatoes then roasting them in the toaster oven. I also oven baked a few strips of turkey bacon and then crumbled them into bite sized pieces. After pre-baking the dough I sprinkled on cheddar cheese, arranged the potato slices and bacon bits, then baked the pizza for about 10 minutes. When the pizza was finished baking I garnished it with chopped chives and a dollop of sour cream. This pizza was extremely flavorful! You could taste all of the individual ingredients and combined it was like one big potato skin. It even inspired a little football nostalgia!